Last edited by Aelk799; 11-17-2018 at 05:41 PM. I got mine installed last week and made it to the lake today. The pics that Aelk posted are pretty straight-forward as to what they look like installed. Those came from a facebook site and he had a few more pics during installation, but it is so easy I didn't take any. Position the mirror, mark the holes (3 on left and 2 on right), then drill and mount. The posts above, he had to drill another hole for the sunshade, I don't have that. The instructions do call for marine silicone to be run around the inside edges, I also put some on the holes. Now, the real info. At the lake, when seated (I have a Trixx with the handlebars about 75% up), they were great. They are convex, so they do not need to be adjusted to see behind you (which is good, because they cannot be adjusted. They are fixed). Standing up, they weren't much good, but I wanted them for they few times I tow (and I would be seated then). At speed, you can see directly behind you, even when turning, from at least one mirror. I attached a pic where you could see what kind of view you get. 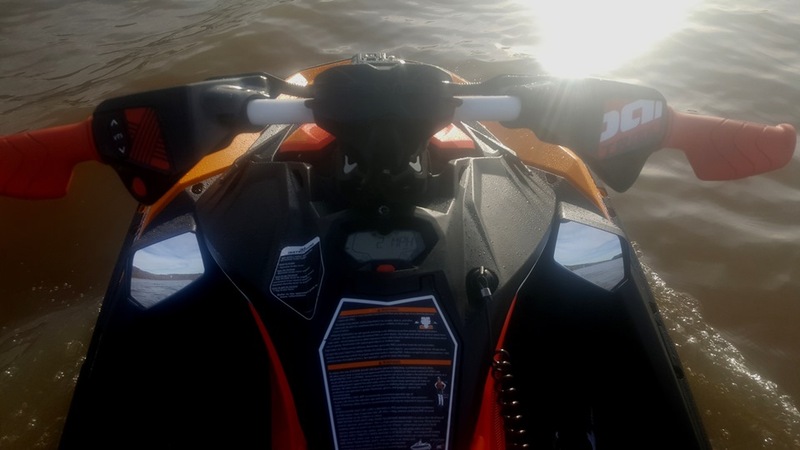 No interference with the Sea-Doo Spark cover. All in all, I like them. They look much better than the after-market ones I had seen and perform fine (which I actually have, just hadn't gotten around to installing). Last edited by randy328; 11-24-2018 at 09:32 PM. how well do they work when standing? is it all knees? When standing you get mainly the foot well and knees. It was actually hard to look down to even see them while standing, you can't see the whole mirror as the top "shades" part of them. I tend to stand closer to the bars than when I am seated, so they really didn't do much for me. where do you get them online? I would like to get those..............were they hard to install?